New Delhi : In a first-of-its-kind outreach from which opposition leaders kept away, RSS chief Mohan Bhagwat on Monday said the organisation has emerged as a “power” in the country and many people target it out of fear but said diversity should be accepted and it should not become a reason for discord. In a 90-minute speech at the opening of a three-day event “Future of Bharat: An RSS perspective”, he traced the history of RSS, expounded on the concept of Hindutva and the participation of women in the outfit that is perceived to be largely male dominated. “It’s (RSS) work gets advertised automatically when its power increases. And when its work gets popular, then people try to learn more about it. And then few people target Sangh out of fear of its increasing power which is quite natural,” he said to the gathering at the Vigyan Bhavan, normally reserved for state functions. Those present included several of the Modi government, bollywood personalities like Anu Kapoor, Madhur Bhandarkar, Ravi Kishen and Manisha Koirala and expelled BJD MP Baijayant Panda, Amar Singh, Subramanian Swamy and nominated MP Sonal Mansingh. He said that a lot of debate takes place over RSS. “Debate and discussion should take place but for the debate reality should be known,” he said. Bhagwat said people perceive Sangh to be a very dictatorial organisaiton and noted that sarsanghchalak is also mistakenly also called chief. “They think he is chief, he will say and others will follow,” he said, adding that people should witness working of Sangh from inside to know how it works. He said that because RSS had a unique identity, it gets popular amongst people and its workers do not run to advertise its work. On the frequent criticism about women not being given equal participation in RSS, he said there was different wing for them which works in parallel with the main organisation. If a change has to be made, the suggestion has to come from both sides. He said words like remote-control are used about the working of Sangh. “What does a swamaysevak do in his public life, it is for him to decide. He chooses his area of work, we do not tell him which area”to work,” he said, adding that RSS also its —critics. Against the criticism that RSS controls the BJP-headed governments, Bhagwat said the organisation does not remote-control its affiliates, does not want dominance, does not seek publicity and its effort is to create good swayamsevaks in every village of the country to create a disciplined society that will take the country towards glory. Apparently dismissing criticism by detractors that the RSS had no role in the independence movement, he said said the first Sarsanghachalak (chief) had worked with freedom fighters, was a member of Indian National Congress and had held Mahatma Gandhi in esteem. He said RSS workers held the national symbols including the national flag in the highest respect and respects its opponents. 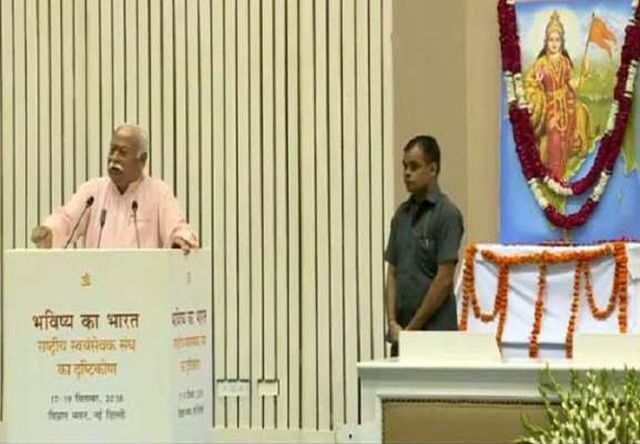 Bhagwat said the purpose of the lecture series was to inform people about RSS which was founded in 1925. He said the RSS builds human character. “To make good swayamsevaks stand in every village, every street is what Sangh wants. What is meant by a good swayamsevak? It means a person bearing good and reliable character, accepts the entire society as his own and works selflessly and does not look anyone with enmity and gives affection to society. This vision was conceived in 1925. The Sangh is all about this and nothing else,” he said. He said there is need for society to be free of discrimination, corruption, greed and have equality but it will not by wishes alone. He said sanskar was given in Indian families and it made for culture and it is reflected in the deeds. Referring to Hedgewar, Bhagwat said he used to ask, “what is the main problem of the country”. He said the solution to the problem will be called “Hindu thought” by the world outside. “Due to that culture, there is Hinduness, hence Hindutva binds us together. Hence he said we will organise the entire Hindu society. There are people in that who say I am not Hindu. But if content is to be told, what is the word. There is no other word. Hence he said cleary that Hindustan is Hindu Rashtra and we will organise the Hindu society,” Bhagwat said. “He did not make the announcement because he had to oppose somebody. This was not in reaction to some immediate developments,” he added. He said society without differences is a guarantee of independence and that of national glory, nothing else. “A discplined society reaches glory hence it is work of person character building,” he said. He said Hedgewar did all the experiments and had a clear vision. “He did not do anything except announce that the Sangh to organise the entire Hindu society begins from today”, he said, adding that the shakhas, marches to band and drills all came about subsequently following open discussions.